Surface smoothness of golf tees is a desirable characteristic that aids the golfer in addressing and driving the ball. A smooth surface ensures a level and balanced stance during the execution of the tee shot, necessary for delivery of the golf club along the desired path to hit a long and straight shot. Unfortunately, unlevel tees are all too common and never ending issue on golf courses. Given the amount of golfer traffic today, and the resulting divots, topdressing, surface compacting and settling, it isn’t any wonder why tees become uneven. Nevertheless, depressions or undulations generally occur over a period of time, requiring rebuilding to correct. 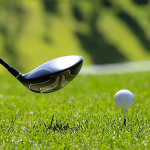 This process is one that typically, depending on the number of rounds a course does, must be done on a continual basis over the life span of the golf course. Historically, traditional methods of rebuilding and leveling using I-beams, grader boxes on small tractors, concrete forms, and transits are time consuming, labor extensive and costly to the club as a tee may be closed for months. A faster, more reliable method is available and is more popular with both golf course superintendents and golfers alike. The utilization of A laser controlled automated grading machines have significantly reduced the time required for tee reconstruction by abandoning old technology for new technology. A skilled laser operator can level an average-size tee in 45 to 75 minutes. Traditional grading methods can take as long as eight to 16 hours. The degree of accuracy achieved with the laser-guided boxblade is second to none, producing result in most cases +- 1/4 inch, and is superior to any other method available and is performed in a fraction of the time. Fusion Golf understands the needs of the golf course owner and the importance of minimizing the impact of the construction process to the club and its guests. We have specialized equipment and years of experience to move through your project quickly and efficiently, minimizing the impact to the club and producing the best product available.